VVVVVV is one of those games that doesn't feel like it should exist. It's name alone is hard enough for most people to compute. Then just look at the thing. It's nostalgic for a period of gaming that even I'm almost too old to remember, a pre-Mario era when player characters had just just two frames of animation and spent their time dodging attacks from living stop signs and giant, automated representation of the word "NO!" That's not exactly what's hot on the streets right now, is it kids? Still, that didn't stop our own Anthony Burch (now an internet superstar and game developer himself) from giving the game a 10/10. For a lot of you, that should be enough. I know it was for me. That's why I bought the game on PC earlier this year, and I loved every minute of it. Now the game has come to the 3DS, and people want to know if it's still a 10/10. I will give you the answer to this question. As all of you who just read Anthony's review will know, VVVVVV is the story of a space captain and his crew, lost in a bizarre and treacherous otherworldly landscape. There is an accident early on in the game that strands and scatters the crew, and it's up to you as Captain Viridian to rescue your compatriots before escaping from this bizarre (and awesome) dimension. Captain Viridian must traverse a landscape where gravity is less of a law of nature, and more of a suggestion of nature; a suggestion that the good captain can interpret (and often ignore) in a variety of different ways. Along the way, he'll chat with his crew (if he can find them) and unravel the story of this strange potential death trap by examining the text found on various monitors strewn throughout the game's world. There is a good amount of dialog here, especially for a platformer, but it's never long winded or hard to chew. The writing is earnest, sometimes funny, unpredictable, and sets the tone of mystery, desperation, and excitement appropriate for a game where escape from a cartoon space disaster is the primary order of business. Like I mentioned in the intro, the game looks like something from 25 years ago. It hearkens back to the days when the Commodore 64 was one of the the most powerful gaming machines on the market, a time when technological and financial constraints made surrealism practically a requirement for most games. 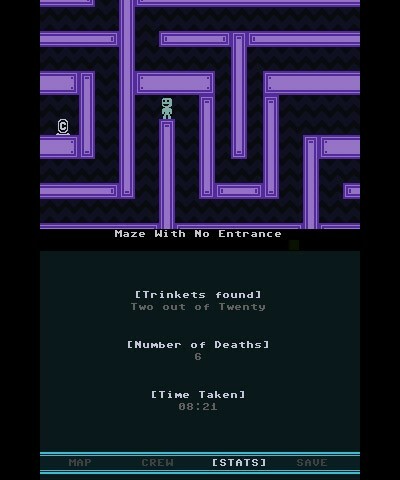 There was a certain weirdness to those days that VVVVVV captures perfectly. Those little anthropomorphic stop signs I talked about earlier, gaggles of flying red skeletons, a giant glowing elephant, flying words like "YES" and "OBEY" are all among the many "characters" you'll encounter throughout the game. It's a bit like Yellow Submarine by way of low resolution sprites, and I totally love it. The music is also fantastic. Like the main game, it never gets repetitive by virtue of its consistent charm and technical excellence. Stylistically, it's somewhat like the classic Mega Man soundtracks, but less beat driven and more melodic, with an encouraging tone being the primary theme throughout. My only complaint about the music (and the rest of the game) is that there isn't more of it. More about that later. The game's design is immaculate, playing a bit like a cross between Metroid and Super Meat Boy. 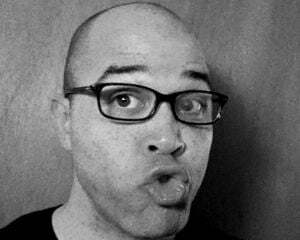 It works hard to be as non-linear as possible, and it never relies on the same ideas for too long, which keeps the excitement coming at a steady pace. The game is constantly coming up with new ways to challenge your perception, starting with the game's signature gravity flip, and moving to teleporters, dissolving walkways, conveyor belts, trampolines, auto-scrolling backgrounds, Pac-Man style warp tunnels, and even being tasked with the job of controlling 2 characters at once. Not all of this stuff is totally original, but when combined with that signature flip mechanic and the game's impeccable pacing, difficulty tuning, and general craftsmanship, it comes of as something very special, and more importantly, very replayable. A big part of what makes VVVVVV so engaging is the way it asks you to analyze nearly every screen in the game's large and often non-linear world map. Like most great platformers, VVVVVV encourages you to really get to know its environments by forcing you to engage within them beyond the surface level. We instinctively think of the world in terms of up and down, left and right, but VVVVVV does it's best to turn those rules on their head; up can be the only way to go down, left is the way to go right, and so on. That kind of defiance of physics can make for a difficult game (I think I died 700 times on my first playthrough). That said, I rarely felt overly daunted or stuck in my time with VVVVVV. The difficulty tends to come more from challenging you to figure out how to look at the screen to beat a level, and not as much on pure reflexes and timing like Bit.Trip RUNNER or Super Mario Bros.: The Lost Levels. There is no way you'll get through this game without some tenacity and fast fingers, but it's not quite as hard as those two other indie platformer icons. The game also has plenty of checkpoints, which goes a long way towards preventing you from feeling stuck or sick of a certain area. That's part of why the game runs a little short. With so little forced replay, my first run through (without collecting all the pick-ups required to see the campaign's best ending and bonuses) was about 2 hours. Thankfully, Terry Cavanagh and Nicalis provided us with tons of bonus content, including time trials, a flipped mode, a no death run mode, and other ways to play through the campaign again (like invincibility and slow-mo modes to make the game easier, a flipped mode to make it harder, etc) . There are also 18 player-developed versions of VVVVVV included, with completely new storylines and level designs, which generally range in size from 1/10 to 1/2 of the original game. 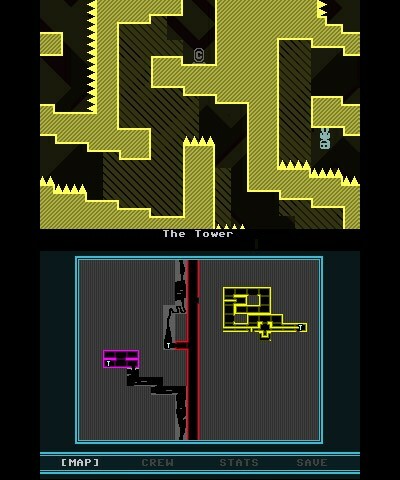 The first 10 levels are from the PC update of VVVVVV from earlier this year, which were developed by members of the VVVVVV fan community, including Notch (creator of Minecraft). The remaining 8 levels are brand new, so there is plenty here for people who have played through VVVVVV on the PC and are looking for more. Some of them are really extensive from a gameplay perspective, while other are all about personality. One of my favorites is Victuals. 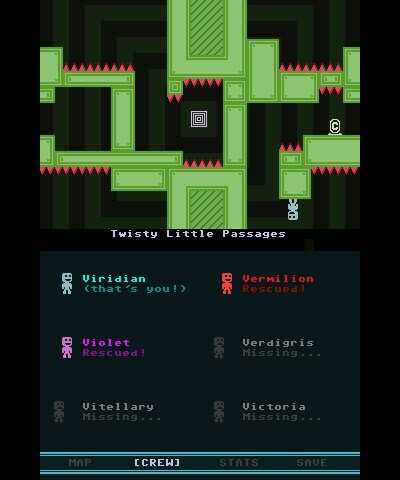 It takes the whole VVVVVV scenerio in a funny but creepy, Twilight Zone like direction, complete with twist ending. Regardless of what your favorite part of VVVVVV is (writing, level design, or graphics), these new levels will be sure to impress. The other two big advantages to this 3DS port are the two screens (which make managing the game's relatively large map a cinch) and (you guessed it) the glasses-free 3D display. It works really well, and pretty much cements my opinion that 3D works best with low res, 2D sprites. The least complex shape seems to cut down on the potential for ghosting or other glitches that can come from misaligned 3D images. On a stylistic level, 3D works to remedy the primary downside to low resolution, sprite based graphics. Even when created by the most skilled artists, single color sprites tend to looks a little flat. 3D fixes that instantly, with minimal cost to the developer, financially or creatively. Thanks to the 3D, the world of VVVVVV feels just that much more like a real (but still thoroughly surreal) place. There are only two downsides that I can find to this port. One is that the level editor and importer is missing, which means that until further notice, what you get with your initial download of the game is all the VVVVVV that 3DS players will ever have. Knowing that there is a whole sea of user created content for the PC/MAC builds of the game makes it hard to say that the 3DS port is the definitive version of the game. There's also the fact that the PC/MAC version is just $5. 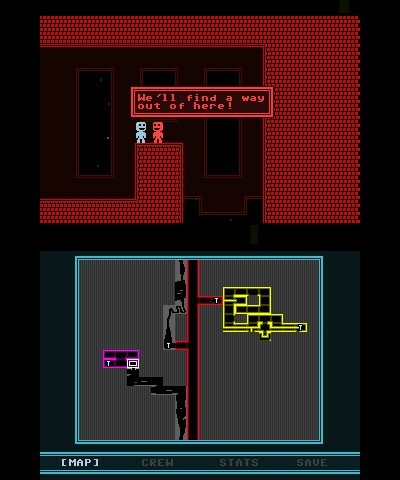 Before I start sounding too negative, it's worth pointing out that when VVVVVV was first released on PC, it cost $15, and was missing the level editor, player created levels, and many other features. 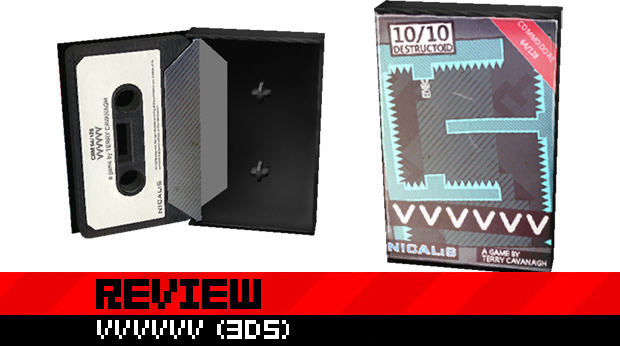 Who knows what kind of new features VVVVVV will get on the 3DS down the line? For now, I can say that this is the best looking, most portable, content-packed initial download of VVVVVV available today. Both fans of the original game, and those new to the world of this frown flipping, gravity ripping space explorer would do well to check it out.